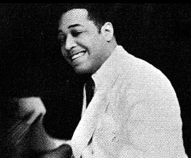 Duke Ellington : Big band charts from the Duke Ellington Orchestra. A few big band arrangements made famous by Duke Ellington and his Orchestra. Edward Kennedy "Duke" Ellington was an American pianist, composer and bandleader who led his jazz orchestra for over 50 years. Although Ellington himself composed in excess of a thousand tunes, it was his collaboration with composer and arranger Billy Strayhorn that turned the Ellington Orchestra from just another big band into a true jazz orchestra. Which famous Ellington charts might you know? A short list of his best known charts would probably include "Take the A-Train", "Caravan", "Echoes of Harlem", "Perdido" and many more. We only have a couple to offer you at the moment, though we will look to add more in the future.